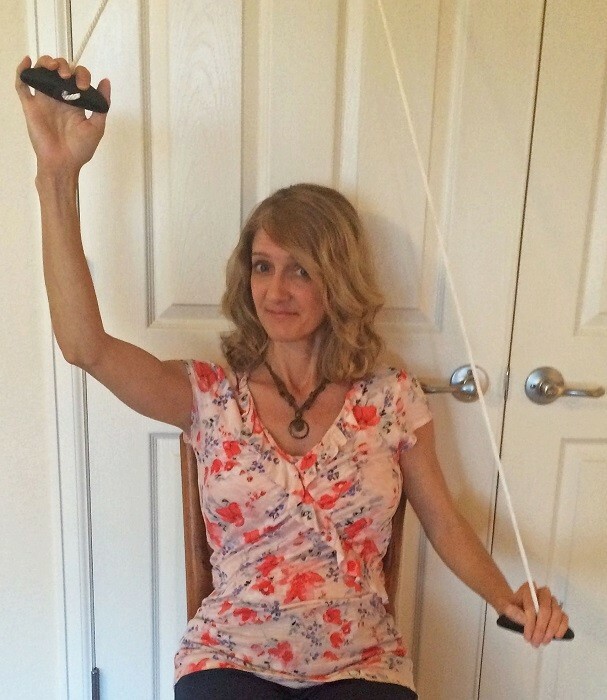 After my bilateral prophylactic mastectomies, I trained at home and mostly focused on physical therapy exercises. I just was not ready to hit the gym until recovering from after my reconstruction. There are both physical and mental hurdles to overcome when you’ve had your breasts removed and replaced, and my insecurity about being in the gym had to do with my appearance (lost muscle, different breasts) and my high level of discomfort and pain. Doing this routine at home worked perfectly, but I missed the gym… a lot. The pulley I used to regain shoulder mobility. Following is the workout I did at home starting about six weeks after my bilateral mastectomy (my exchange surgery for implants happened at week 10, and I talk about how I came back after that one here). This workout incorporated physical therapy exercises to strengthen my upper back and shoulders and stretch my shoulders, lats, and pectoral muscles. I also included a bit of lower-body work and lots of walking. Disclaimer: I am not a doctor or physical therapist. This information is only to show what I did personally. I can’t possibly know what YOU should do – check with your doctor or physical therapist before starting any exercise program. I also added band bicep curls and tricep pushdowns right before my second surgery. Once I got through the initial recovery period after my mastectomies, I regained my fitness level. But of course, I lost strength and muscle after 10 weeks of no heavy lifting. After reconstruction, it was time to start rebuilding. Patience, patience. Once you’re past physical therapy, surgeries, and have your doctor’s ok, you can proceed directly to my posts about strength training after a mastectomy! One last note: If you know a woman who is having or has had a mastectomy, please share my blog with her. It’s challenging for women to find the right support, but they can find a bit of comfort and hope here.